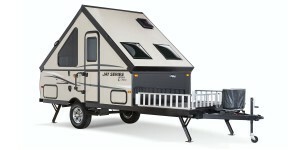 The Jay Series Sport Hardwall is Jayco’s line of a-frame pop up campers. 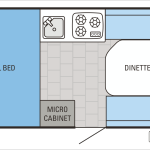 These units sleep fewer people (up to four) than Jayco’s other pop ups, which is a common theme in a-frame campers. 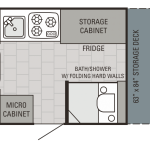 The trade off is that although Jay Series Sport Hardwall campers don’t have the additional sleeping space afforded by pop-out bunks, they stay warmer in the winter and cooler in the summer (with an option air conditioning unit), and there aren’t any soft walls to wear out or leak. 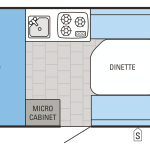 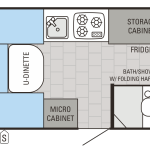 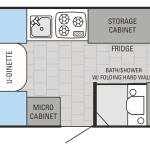 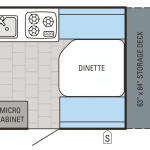 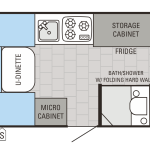 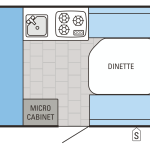 There are currently eight different floor plans in the Jay Series Sport Hardside lineup, some of which include a fully-enclosed, hard-walled bathroom, and others that include cargo decks like the Baja Edition tent trailers.